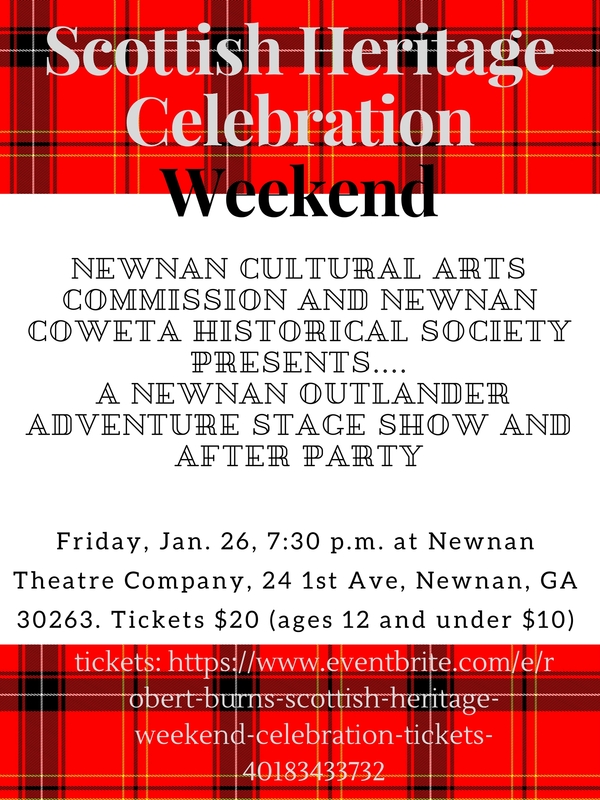 Our next event in partnership with Newnan-Coweta Historical Society. Scottish Heritage Celebration Weekend! Newnan sister city is Ayer Scotland. -- Whisky Tasting -- Saturday, Jan. 27, 3:30 p.m. at The Cellar at Firestone, 20 Jefferson St., Newnan,GA 30263. Tickets $25. -- Ceilidh Celtic Concert -- Saturday, Jan. 27, 4:30 p.m. at The Cellar. FREE. -- Community Auld Lang Syne Sing A Long -- Saturday, Jan. 27, 6:15 p.m., Newnan Court Square, FREE. -- Burns Supper and Dance -- Saturday, Jan. 27, 6:30 p.m., Newnan Historic Train Depot. Tickets $48. The sister city partnership also developed as part of the founding of the educational program Global Achievers in Newnan, the location of their state headquarters. The sister city pact was established in order for citizens of both cities to experience many cultural, educational, tourism, and economic opportunities. "For 16 years we have celebrated our connection with our sister city Ayr, Scotland, and the banners hanging around the square during the month of July are a small reminder of this special relationship. The Newnan Cultural Arts Commission is very excited the Masterworks Youth Chorale has the opportunity to visit Ayr in June, 2014 and represent the citizens of Newnan,” said Dave Dorrell, chair Newnan Cultural Arts Commission. 2013 - It has been announced that the Centre Masterworks Ensemble Choir will represent Newnan in Ayr in the June 2014. Mayor Keith Brady and the Newnan Cultural Arts Commission are excited to have this exemplary group of musicians represent the city. 2011 News Article - Councilman Rhodes Shell visits Sister City Ayr. The city of Newnan and Ayr, Scotland have celebrated a sister city relationship since 1997. The sister city partnership has allowed Newnan residents to build and nurture contacts across the world and has provided for wonderful cultural exchanges. On behalf of the Newnan Arts Commission, “we are proud to recognize our sister city, Ayr, Scotland. The banners that hang around our court square symbolize the friendship and kinship we feel for our friends across the water,” says Bette Hickman, Cultural Arts Commission member. The talented and entertaining Ayrshire Fiddle Orchestra has visited Newnan on two occasions for several community performances.